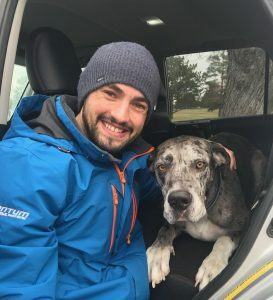 Oshie has a home - Rocky Mountain Great Dane Rescue, Inc.
Oshie has a home with Yvonne and Mike in Longmont, CO! Oshie will be the 2nd Great Dane for the family. They recently lost their sweet boy Maverick, and are anxious to open their hearts and homes to Oshie, who they say could be Maverick’s little brother. Oshie is a pretty active fellow, so landing in this family is perfect for him! Yvonne is excited to take Oshie with her on daily runs, and both Yvonne & Mike love the outdoors, so Oshie will enjoy hiking, camping, and going everywhere they go. He will also be soaking up all the attention, and belly rubs being the only dog in the home. The family has affectionately changed his name to Oshie Moon. Way to go sweet boy!